The histories of two families, a Bulgarian Jewish family that barely escapes the Holocaust and a Palestinian family forced to flee their home during the establishment of the state of Israel, bound together in a house lived in and loved by both. Meticulous endnotes anchor the human narration firmly in the history and events of the time. An essential and well-written book. An Israeli journalist and historian, Gorenberg recaps Zionist History as the preamble to conditions that set up the Occupation of the Palestinian territories post-1967. He then tells the whole tragic story of fanaticism, political cowardice, and failed opportunities. A unique and courageous window into Israeli society and politics. Pappe is an Israeli historian. He is among a group of Jewish revisionist historians called the “New Historians” who have documented the actual actions of Zionist and then Israeli forces at the time of the founding of the State of Israel. This book relies greatly on material from Israeli military archives. It is often emotionally difficult to get through. Allis & Ronald Rodash, A Safe Haven: Harry S. Truman and the Founding of Israel. This book studies the politics and decision making process that led President Truman to support the founding of the modern state of Israel. Shlaim, Jewish revisionist historian and professor at Oxford, covers in detail relations between Israel and the Arabs from Israel's 1948 War of Independence to Prime Minister Benjamin Netanyahu. In doing so, he shatters the “David vs. Goliath” view of the conflict so common among Israelis and the West. Criticized for being too simplistic in presenting Arab side of the conflict. Dr. Rothchild, a medical doctor who worked throughout the West Bank, Gaza and East Jerusalem shares what she witnessed there and carefully describes how her views evolved because of what she saw. Shocked by what he read about the 2008 Israeli military campaign in Gaza, American Rabbi Rosen began to publically question his long held "liberal Zionist" beliefs in his blog Shalom Rav. In 1997, a tragedy struck the family of Israeli-American Miko Peled: His beloved niece Smadar was killed by a suicide bomber. That tragedy propelled Peled onto a journey of discovery. It pushed him to re-examine many of the beliefs he had grown up with, as the son and grandson of leading figures in Israel’s political-military elite. The former president reflects on the actions necessary to bring a true peace to a troubled region he knows well. Pastor of the Evangelical Lutheran Christmas Church in Bethlehem, he conveys an “active hope” even through the long Israeli military occupation. Helpful to those who want to know the basic story of the conflict. She provides a great deal of information in a very short book – unfiltered by ideological lenses. This is an excellent book for someone who wants a brief but thorough overview. Dr. Khalidi has written a relatively short, readable and frankly depressing overview of the more than 35 years of U.S. diplomacy in the Israeli-Palestinian conflict. The noted Columbia University historian provides important empirical evidence and sobering analysis that shatters the mythology that the United States has a genuine desire for a just and lasting peace between Israelis and Palestinians. Voices Across the Divide - 57 min. Filmmaker Alice Rothchild is an American Jew raised on the tragedies of the Holocaust and the dream of a Jewish homeland in Israel. The film follows her personal journey as she begins to understand the Palestinian narrative while exploring the Palestinian experience of loss, occupation, statelessness, and immigration to the US. The documentary is both a personal journey to understand the Palestinian narrative as well as the implications and contradictions of deeply held cultural beliefs in the Jewish community. Rothchild interviews those who participated in the Nakba – and those affected by it. Peace, Propaganda and the Promised Land (2004) - 80 min. This video shows how the foreign policy interests of American political elites-working in combination with Israeli public relations stratgies-influence US news reporting about the Middle East conflict. Combining American and British TV news clips with observations of analysts, journalists and political activists, Peace, Propaganda & the Promised Land provides a brief historical overview, a striking media comparison, and an examination of factors that have distorted U.S. media coverage and, in turn, American public opinion. With God On Our Side (2010) - 82 min. With God On Our Side takes a hard look at the theology and politics of Christian Zionism, which teaches that because the Jews are God's chosen people, Israeli government policies should not be questioned, even when these policies are unjust. Life in Occupied Palestine - 55 min. Anna Baltzer, a Jewish-American Columbia graduate and Fulbright scholar, presents her discoveries as a volunteer with the International Women's Peace Service in the West Bank, documenting human rights abuses and supporting Palestinian-led nonviolent resistance to the Occupation. Baltzer's presentation provides those interested in the Israel/ Palestine conflict with critical information and documentation that can be difficult to obtain through mainstream Western media sources, and to encourage dialog towards taking action on the issue. Topics discussed include checkpoints, settlements, Israeli activism, Zionism, 1948 War & refugees, censorship, the Wall, the ongoing annexation of Palestinian land, and the almost unbearable living conditions under the occupation. Little Town of Bethlehem (2010) - 75 min. The documentary shares the gripping story of three men, born into violence, willing to risk everything to bring an end to violence in their lifetime. A Christian, a Muslim, and a Jew-shaped by events of their Palestinian and Israeli upbringing-find inspiration in the words and actions of Martin Luther King Jr. and Mahatma Gandhi. Sami, Ahmad, and Yonatan believe that violence can indeed be stopped but recognize their own struggles will remain. Yet they will struggle together to discover a common humanity through non-violent action. In the city of Bethlehem where it is said God became man, these men stand alongside others whose central desire is to be accepted and treated as fully human.Their story brings fresh hope to the ongoing conflict between Palestine and Israel while taking a stand against violence throughout the world. The People and the Olive - 70 min. What do olive trees mean to Palestinian farmers? Olives are their livelihood, their source of sustenance and the way they root themselves, historically and spiritually, to the land. But Palestinians are denied access to nearly 30 percent of their beloved olive trees in the West Bank as they struggle to live under Israeli military occupation. How do they persevere? And what should the international community understand about Palestinian olive farmers, who love their land and harvest it every season to feed their families — just as farmers across the world do? On the Side of the Road - 103 min. Filmmaker Lia Tarachansky is a Jew who was born in Kiev. When she was six her family moved to the Ariel settlement in the West Bank. Her mother wanted to contribute to Zionism, Lia said. Tarachansky turns the camera on herself as she revisits settlements and interviews current residents. She says her goal is just to examine and narrate. Checkpoint - 80 min. Documentary filmmaker Yoav Shamir's depiction of the checkpoints that the Israel Defense Forces man in the Palestinian Authority. Defamation (2009) - 101 min. Intent on shaking up the ultimate 'sacred cow' for Jews, Israeli director Yoav Shamir embarks on a provocative - and at times irreverent - quest to answer the question, "What is anti-Semitism today?" Occupation 101: Voices of the Silenced Majority - 90 min. A thought-provoking and powerful documentary film on the current and historical root causes of the Israeli-Palestinian conflict and U.S. political involvement. Five Broken Cameras - 90 min. When his fourth son, Gibreel, is born, Emad, a Palestinian villager, gets his first camera. In his village, Bil'in, a separation barrier is being built and the villagers start to resist this decision. For more than five years, Emad films the struggle, which is led by two of his best friends, alongside filming how Gibreel grows. Very soon it affects his family and his own life. Daily arrests and night raids scare his family; his friends, brothers and himself are either shot or arrested. One Camera after another is shot at or smashed, each camera tells a part of his story. Living under the Occupation: Daily Life in Occupied Palestine - 27 min. A film made by EFA MEPs (Members of the European Parliament) François Alfonsi, Jill Evans and Ana Miranda during their visit to the West Bank and East Jerusalem. Promises (2002) -106 min. Several Jewish and Palestinian children are followed for three years and put in touch with each other, in this alternative look at the Jewish-Palestinian conflict. The three filmmakers followed a group of seven local children between 1995 and 1998. These seven children tell their own story about growing up in Jerusalem. When the protagonists speak out in an epilogue a couple of years later, it becomes apparent that all have lost their childlike innocence. Salt of the Earth: Palestinian Christians in the Northern West Bank (2004) - 193 min. Marthame and Elizabeth Sanders lived in the Christian Palestinian village of Zababdeh from August, 2000, through December, 2003. Volunteers with the Presbyterian Church (USA), their ministry was one of ecumenical support to the Church in the land of its birth. The film documents the lives of nine Palestinian Christians living in the northern West Bank. 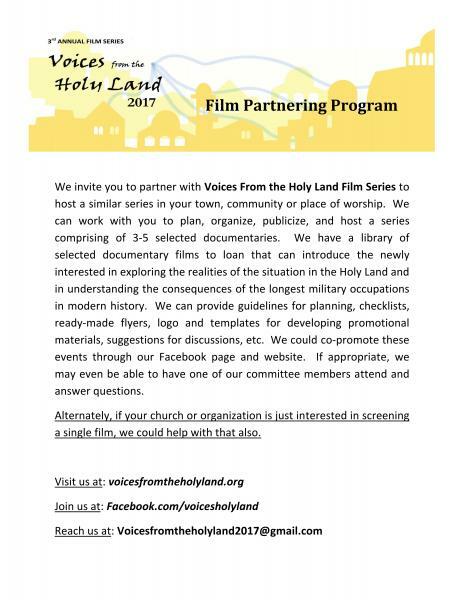 This film grew out of a desire among their Palestinian neighbors to share their stories, and a desire among Christians in the West to hear them. The Sanders describe the project as "a labor of love, a response to the graciousness, warmth, hospitality, and welcome we received from our Palestinian neighbors and colleagues." The Colour of Olives - 97 min. Like many Palestinian families, the Amers live surrounded by the infamous West Bank Wall where their daily lives are dominated by electrified fences, locks and a constant swarm of armed soldiers. Constructed with a combination of verité scenes and re-enactments, this poignant and richly crafted film offers its audience a much needed opportunity to reflect on the effects of racial segregation, the meaning of borders and the absurdity of war. The Law In These Parts (2013) - 105 min. What is legal and what is just? The wide gap between the two is explored meticulously by this Israeli investigation of the legal structure created after the 1967 Six Days War, specifically to treat the West Bank and Gaza Strip as occupied territories. Speaking with some of Israel’s most respected lawyers and judges – men who helped to craft and later interpret these laws – filmmaker Ra’anan Alexandrowicz asks tough, pointed questions and gets even tougher answers. He asks his subjects to consider the consequences of their actions in a highly politicized environment. This documentary takes the position that unjust laws create unjust realities. Laws that everyone admits are not perfect but are the best that can be done under difficult circumstances may result in tragedy for everyone: both the judges and the judged.This film is winner of the Best Documentary Award at the Sundance and Jerusalem Film Festivals. It's Better to Jump - 75 min. There is a centuries-old seawall in the ancient port of Akka, located on Israel's northern coast. Today, Akka is a modern city inhabited by Muslims, Christians, Jews, and Baha'i, but its history goes all the way back to rule of the Egyptian Pharaohs. Young people dare to stand atop the 40' one-meter thick block structure and risk their fate by jumping into the roiling sea. This perilous tradition has continued for many generations, and has become a rite of passage for the children of Akka. "It's Better to Jump" is about the ancient walled city of Akka as it undergoes harsh economic pressures and vast social change. The film focuses on the aspirations and concerns of the Palestinian inhabitants who call the Old City home. Home Front – Portraits From Sheikh Jarrah - Getting beyond the sensational headlines and broad generalizations that normally dominate discussions of Jerusalem, Home Front captures voices rarely heard, of those struggling to stop settlement expansion in East Jerusalem and build a future of pluralism and equality in the city. Featuring the accounts of a Palestinian teenager forced to give up half his home to Israeli settlers, an American-born Israeli mother who gets drawn into the demonstrations after her children’s arrest, a Palestinian community organizer who brings local women to the forefront of the struggle, and a veteran of the Israeli army who becomes one of the campaign’s leaders, Home Front chronicles the resolve of a neighborhood, and the support it receives from the most unexpected of places. Censored Voices - The 1967 'Six-Day' war ended with Israel's decisive victory; conquering Jerusalem, Gaza, Sinai and the West Bank. It is a war portrayed, to this day, as a righteous undertaking - a radiant emblem of Jewish pride. One week after the war, a group of young kibbutzniks, led by renowned author Amos Oz, recorded intimate conversations with soldiers returning from the battlefield. The recording revealed an honest look at the moment Israel turned from David to Goliath. The Israeli army censored the recordings, allowing the kibbutzniks to publish only a fragment of the conversations. 'Censored Voices' reveals the original recordings for the first time. Teaching Ignorance - 2015, 52 Minutes. This powerful film follows several Israeli and Palestinian teachers over the course of an academic year. It asks: How do the Palestinian, Israeli Arab, and Israeli Jewish educational systems teach the history of their peoples? By observing teachers, the film shows us their exchanges and confrontations with students as they transmit the values of religion, politics, and nationalism in the classroom. In Teaching Ignorance, educators from all sides of the conflict debate their peoples’ official curriculum, wrestling with is restrictions. This film offers an intimate glimpse into the profound and long-lasting effect that the Israeli/Palestinian conflict transmits to the next generation. Grace Episcopal Church, Washington, D.C.
St. Patrick’s Episcopal Church, Washington, D.C.